Meaning basket, Cestino weaving is a design staple in Italy from hand bags to ceramic tile and tapestry to breads. 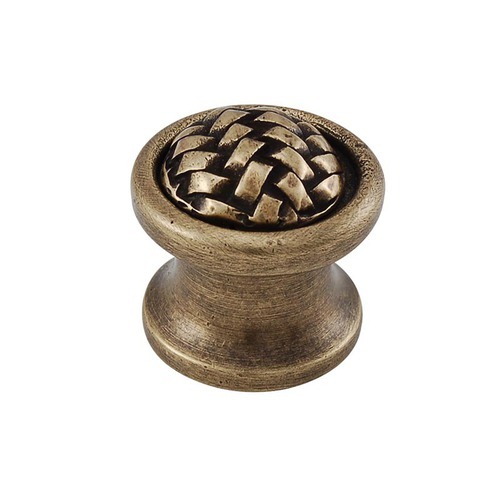 The Cestino (basketweave) small knobs will add a sense of Italian country charm to your cabinet or furniture. Available finishes include Antique Brass, Antique Copper, Antique Gold, Antique Nickel, Antique Silver, Gunmetal, Oil-Rubbed Bronze, Polished Gold, Polished Nickel, Polished Silver, Satin Nickel and Vintage Pewter. Mounting hardware is included. 100% lead free pewter. Handcrafted in the USA. Meaning basket, cestino weaving is a design staple in Italy from hand bags to ceramic tile and tapestry to breads. The 100% lead-free pewter Cestino (basketweave) round doorbell will add a sense of Italian country charm to your front entrance. Available finishes include Antique Brass, Antique Copper, Antique Gold, Antique Nickel, Antique Silver, Gunmetal, Oil-Rubbed Bronze, Polished Gold, Polished Nickel, Polished Silver, Satin Nickel and Vintage Pewter. Mounting hardware is included. 100% lead free pewter. Handcrafted in the USA. Meaning basket, cestino weaving is a design staple in Italy from hand bags to ceramic tile and tapestry to breads. The Cestino (basketweave) pulls will add a sense of Italian country charm to any cabinet. Available finishes include Antique Brass, Antique Copper, Antique Gold, Antique Nickel, Antique Silver, Gunmetal, Oil-Rubbed Bronze, Polished Gold, Polished Nickel, Polished Silver, Satin Nickel and Vintage Pewter. Mounting hardware is included. 100% lead free pewter. Handcrafted in the USA.